Shutter: 1/4,000 ~ 30 sec, bulb. Carbon fiber and Kevlar, tested to 150,000 cycles. Price: $2100 for body, $2,700 for kit, very far from "entry level"
Could be very interesting depending on what they strip from the video features. Already like the idea of keeping the DX crop mode. Just curious to see if it also will have the 8bit 4:2:2 HDMI out. My guess is it will use the 24MP Sony Sensor. Maybe Striping the will be from the Photo Mode instead( lower frames per Second photo capture, lower auto focusing Points....etc) with maybe a few minor video auto functions in the place of more desired manual functions. I hope the "DX" mode can manually be selected to shot DX crops with "Full Frame" lenses not just "Auto" selection for when "DX" lenses are attached. From the moment the D4 came out I thought the real benefits would be down the line when they released better lower end cams. This could be a very interesting cam. I don't expect the low-light performance to be good with a pixel count that high. @Preetam, the 5D3 has a similarly high pixel count and it does very well in lowlight. I think the D600 could be quite interesting so long as it doesn't suffer like the D4 in terms of how it works in FX mode. I don't know what they did wrong for the D4 to be so bad in FX mode and yet so good in 2.7x crop mode. $1500-$2K seems to be the consensus. FF cameras and mirrorless are made for one another :-) I think it'll be the moment then we'll see real price drop to near $1200. D600 Photos from Nikonrumors.com, which were posted from xitech.com. It looks like it has about the same dimensions and button layout as my Nikon D7000. Announcment must be 13.09. Next day after Sony FF stuff. The Wireless Mobile Adapter Utility Application must be installed on the smart device before it can be used with the WU-1b Wireless Mobile Adapter connected to the Nikon D600. Wi-Fi is now standard feature for all new cameras. Specs in top post updated. Clean HDMI out? is that correct? Yes , Clean HDMI out just like its big brothers D4/800. I've been super impressed with the stuff I've shot with the D800 via external recorders and less impressed with the D4 stuff. I wonder if Sony makes the D600 sensor like Sony makes the D800 sensor? I'd love the inside story on how Sony sensors came to be in every future camera. I'm interested to see how the codec on the D600 performs. Even if Sony makes the sensors, Nikon engineers are brilliant at tweaking it to their needs. 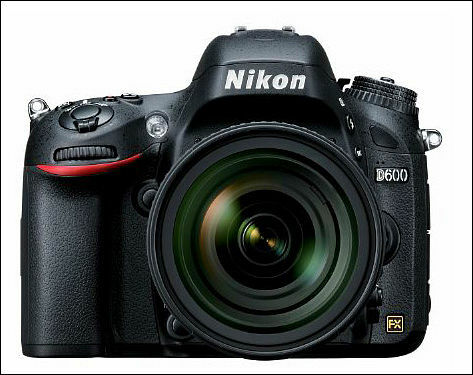 According to Nikonrumors.com, the price of the D600 is $2700. The D800 is $2999 so I guess the D600, being "Entry" level, made it only $299 cheaper? Read a bit more, it is said that the msrp of the d800 was more like $ 3700 when it came out in Japan, so you can expect that the price in the US will be a bit lower. You cannot compare US price to Japan price. Some putting it more like $ 2000 in the US. I for one believe that nikon, at the moment, have the best internal video codec of all dslr's on the marked. Hopefully the d600 become just as great as the d800 , both in fx and dx format. The fine grain structure and the almost non existing mud in the deep shadows is really great at such low bit rate . Would love to have that codec in the gh2. The 422 hdmi dump actually puts the d800 in another league, regard professional HD production. But if you don't have to much action in front of your lens, than you really don't need the 10x extra data IMHO. A d600, around 2000 bucks, may be a must have. They f@$& up the D4, but Nikon is defiantly in the game by now, so who knows. I forgot about that! Thanks for reminding me. I think the gh3 is what I will probably be more interested in. I had the Canon 7D but went to the Panasonic GH1 because of the superior video image quality with the hacks. I now have a Nikon D7000. The reason for going to the D7000 was, although the Gh1 was superior in image quality, I just couldn't get use to the small form factor or the plasticky feel of it after coming from a larger magnesium alloy body, the 7D. However, If the gh3 will really be similar in size to a 7D or D7000, with a metal alloy body, AVCHD 2.0(1080 60P) , and without the moire and to a less extent aliasing, with a better or significant improvement in video image quality, it would everything I would have wanted. According to the specs of the D600, the D600 uses the entire width of the sensor for video. I believe that the D800 uses only %95 or so of the width of its sensor, about a crop factor of 1.1X. "The Nikon D600 can capture Full HD (1080p; 1,920 x 1,080 pixel) video at either 24, 25 or 30 frames per. For 720p (1,280 x 720 pixel) video, a rate of 60 frames per second is possible. Video can either be shot using data from pixels across the entire width of the image sensor in FX mode, or with a 1.5x (DX-format) focal length crop, taking data from the center of the imager, without affecting the video resolution." Very curious about video performance here. I am quite happy with the D800 codec. I would imagine similar quality with the D600, with perhaps better moire/aliasing control - not that it has been a huge problem with my D800 so far.Also looking forward to seeing video quality in DX mode. Well guess we will find out in an hour or two. Yes the D800 crops a little bit of the frame.